The Hotel Roanoke & Conference Center, Curio - A Collection by Hilton, listed in the National Register of Historic Places, encompasses a glorious history that began in 1882. Since then, the hotel has grown into a cherished destination for Roanoke's visitors looking for a Virginia getaway that is entwined with historical sites and vast scenic treasures. 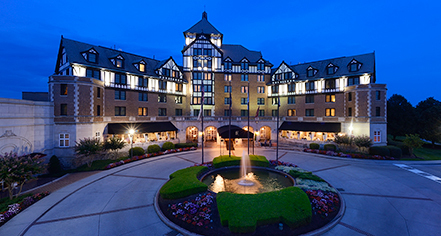 With classic Tudor Revival architecture and a sprawling convention center situated amid the Blue Ridge Mountains, guests visiting for business or leisure can bask in its distinctly Southern charm coupled with unparalleled hospitality. Offering charming dining outlets with exceptional cuisine, recreational spaces of a fitness center, pool, and in-room spa services, and a myriad of amenities for its guests, the hotel offers a relaxing respite from the day's sightseeing adventures through historic Roanoke and Virginia's long list of matchless destinations. Click here to view a video about The Hotel Roanoke & Conference Center, Curio - A Collection by Hilton. 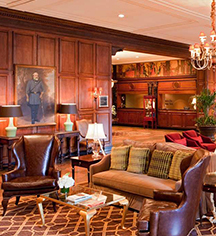 The Hotel Roanoke & Conference Center, a member of Historic Hotels Worldwide since 2014, dates back to 1882. The hotel's Palm Court features a ceiling with a unique constellation design - one that replicates the sky exactly as it appeared on the day that the first train stopped at Roanoke's station in 1852. Airport Transportation: 24-hour airport shuttle service is available at scheduled times. Contact the property in advance to make arrangements. Deposit: Credit card required for reservation. Occupancy Restrictions: Varies per room type. Parking: Self-parking fee: USD 10 per night. Valet parking fee: USD 16 per night. Payment: All forms of payment are accepted. Payment is required at time of booking. Visa, MasterCard, Amex, JCB, Diners Club and Discover are accepted. Rollaways: Available upon request; $15.00 per night. Shuttle Service: Area shuttle; complimentary. The Hotel Roanoke & Conference Center, Curio - A Collection by Hilton, listed in the National Register of Historic Places, encompasses a glorious history that began in 1882. Learn more about the History of The Hotel Roanoke & Conference Center, Curio - A Collection by Hilton .